Boater Ronald Rosse said he's concerned an alligator is stuck in a well on Patricio Island. PATRICIO ISLAND, Fla. — Ronald Rosse boats nearly everyday near Bokeelia. 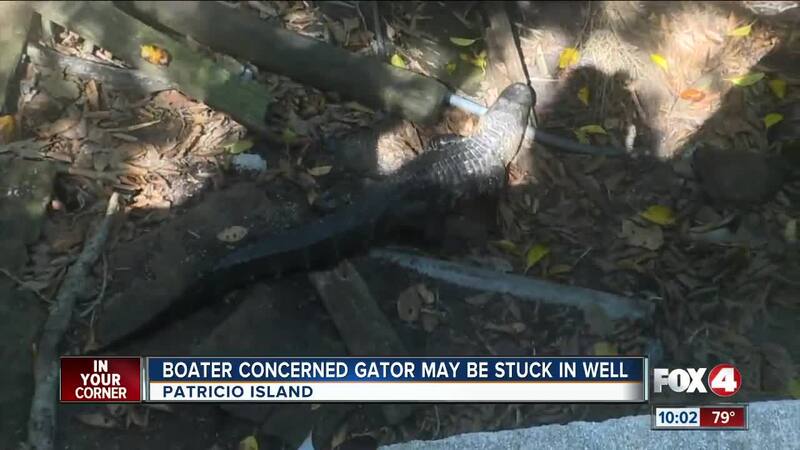 His friend told him an alligator was trapped in a well on Patricio Island, about two miles southwest of Bokeelia. So he said he decided to see it for himself. “The poor thing can’t get out. He’s stuck,” he said. The words “danger live gator” are etched on a tree right above the well. The alligator was sitting at the bottom of the well Sunday afternoon, and as soon as it heard people, it ran into a hole. It’s unclear if that hole is a way for it to get in and of the well or if it’s a hiding place. Rosse said he tried to get Florida Fish and Wildlife Conservation Commission to rescue it, but had a hard time explaining where it was. FWC spokesperson Brian Norris said there are a few options, but it’s hard to determine without assessing themselves. The alligator would have to be at least four feet long for them to release it since they don’t consider smaller ones a threat to people or pets. Rosse said if the alligator is trapped, he hopes FWC will set it free. “See it returned into the wild and let it just live its life the way it’s supposed to.,” He said. FWC said they’re working to send someone out to assess the situation sometime this week.